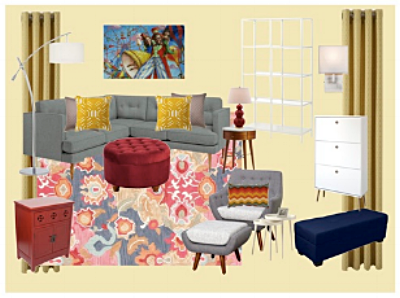 We create your custom design roadmap for 2 rooms complete with layouts, mood boards, and a click n' buy shopping list. Then you bring the design to life! creates the perfect layout for 2 rooms* or an entire studio apartment. identifies your style sensibility using our Design Style Questionnaire--contemporary, traditional, rustic, beachy, etc. decides which furniture pieces to reuse/replace. determines artwork placement and window treatments. makes a list of 6-8 or 14-16 specific furnishings needed for the design. Back at the office, your designer shops virtually for the pieces on your list. Your itemized shopping list is SUPER specific. It includes exact links to pieces from specific stores. All the furnishings will fit within your budget. Your designer also creates custom mood boards to help you visualize the transformation. Not sure how many items you need? No worries! During the visit, you decide how many pieces you want the designer to find. Click to see a sample shopping list. reveals your shopping list and custom mood boards. sources optional items for select pieces. answers questions that have come up since the house call. Bring the design to life when you are ready! Want more than 2 rooms designed? Need more than 16 items for your space? No problem! Click here to check out our Add-Ons and customize our plan to your project.